Shawn Lewis and Stephen Romano, the founders of EIBON PRESS, know how to do horror and they do it well. Each graphic novel (emphasis on graphic) comes encased and sealed in a sturdy sleeve, with shrink wrap and a hand pressed sticker to boot. Limited to 2000 copies, these fully licensed movie tie-in comic books look and feel wonderfully grotesque. It really doesn’t get much better than this. 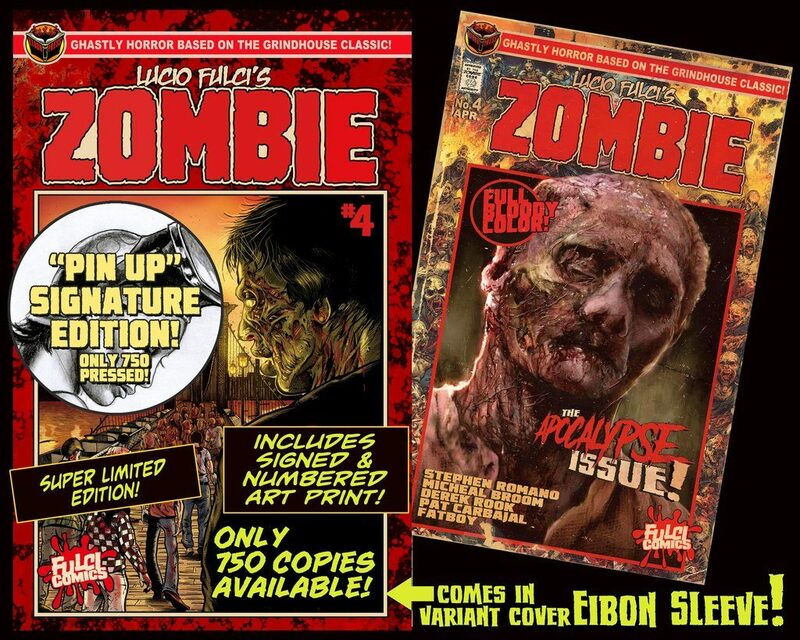 Bottom line: EIBON PRESS is doing the comic books that most teenagers can only dream of. They offer horror fans who are collectors of records, movies and comics something highly unique to dig their teeth into. Additional goodies include stickers, bookmarks, trading cards and a certificate of authenticity booklet that gives a peek at what is yet to come. If you don’t receive this booklet with your comic, it’s not from EIBON PRESS. If super limited editions are more your forte, you can order ZOMBI #4 Blood red vinyl edition (which of course comes with a 5-inch vinyl record). The vinyl A-side contains the classic ZOMBI theme by FABIO FRIZZI, remixed and re-mastered, while the B-side is home to an all new recording of the theme (just for this release) by film composer RYAN FRANKS. If you’re more into signed collectibles, grab one of a limited number of “book plate” editions signed by EIBON PRESS founders STEPHEN ROMANO and/or SHAWN LEWIS. The duo has really done a great job of translating the Godfather of Gore to the comic page. 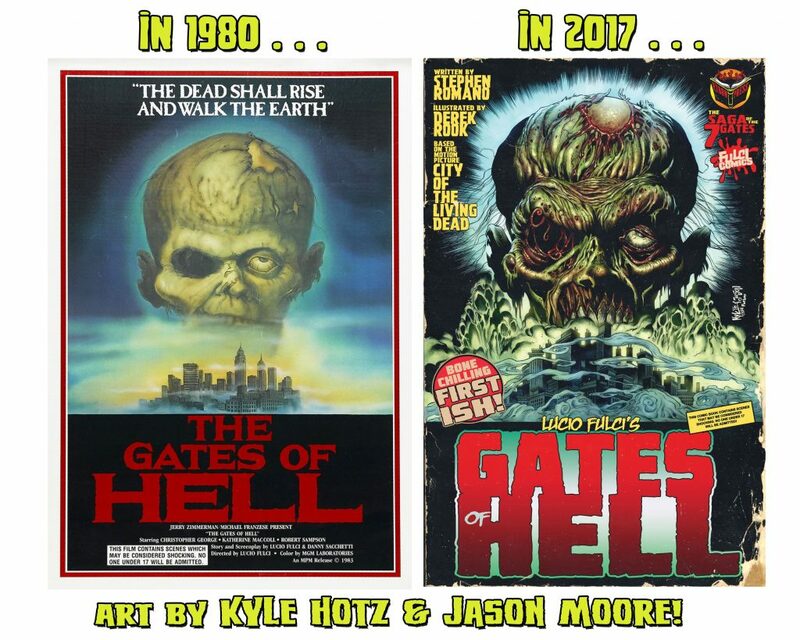 ZOMBI and GATES OF HELL stories use the original movie material as a template and expand on it in mind-blowing ways. Romano, the editor, art director and lettering artist of every EBION PRESS comic book, is also a screenwriter, illustrator, and author, and has worked on the gone but not forgotten SHOWTIME series MASTERS OF HORRORS. He shows great control and care for the original Fulci classics, but is also branching the master’s vision into his own blood soaked path. Shawn Lewis is founder of ROTTEN COTTON GRAPHICS and is also renowned for being a writer and producer and will be featured as co-author of Eibon Presses’ original BOTTOMFEEDER comic book. The art by artists MICHAEL BROOM (Zombi #1-4), PAT CARBAJAL (Zombi #5-8) and DEREK ROOK (Gates of hell) is exquisite and exhaustive. There’s so much detail in each page, that it’s truly a thing you witness. PAT CARBAJAL will be the artist working on most of the new releases; he handled Eibon’s original series BOTTOMFEEDER prior to tackling art on THE BEYOND. 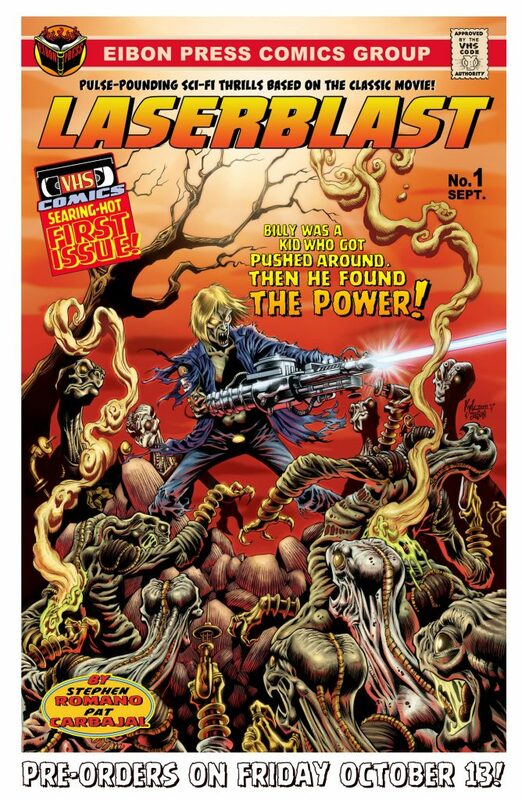 Aside from the trilogy of FULCI terror, VHS comics are on the horizon for release by EIBON PRESS. These titles include LASERBLAST and MANIAC, both of which will also be expanded from the source material. The new line will specialize in adapting and adding to fan favourite horror films from the age of the VHS video, and the boxes that the comics come housed in can be assembled to resemble VHS boxes. Follow EIBON PRESS on Facebook! And keep your eyes open for an announcement of more titles on Halloween!